Traumatic scars can detract from your appearance as well as your self-esteem. If you want to discover your options for removal of traumatic scars, look no further than Miami Dermatology and Laser Institute, serving the Miami, Ft. Lauderdale, and Kendall areas of South Florida, and led by Jill Waibel, MD, FACS, a board-certified dermatologist and celebrated specialist in the field of scar revision. Anything from small lacerations and abrasions to life-threatening accidents and injuries can leave traumatic scars. When this happens, patients worry not only about scars left by the trauma itself, but also those created by primary surgical repairs. After the initial trauma and reconstruction, surgical strategies remain critical for dealing with functional problems created by scars. Until recently, physicians commonly waited a year or so after the initial reconstruction for the scar to mature and perhaps spontaneously improve before attempting procedures such as flaps and grafts. However, these surgeries themselves often have difficult recovery periods and may need to be repeated. Fortunately, lasers – particularly fractional ablative lasers – provide a helpful halfway point between conservative measures, such as physical therapy, scar massage and intralesional injections, and revision surgery. In properly selected cases, lasers can be used as early as two to three months after the initial trauma or surgical repair to reduce the formation of potentially debilitating contractures. What are the signs of a traumatic scar? Traumatic scars can be depressed or atrophic, as in the case of burns or other injuries that cause tissue loss. On the other hand, traumatic scars resulting from lacerations may be hypertrophic – pink, red or purple, raised, and extending beyond the margins of the original injury. Additionally, some accidents can result in traumatic tattooing, or the embedding of foreign objects such as asphalt particles within the skin. Who is most susceptible to traumatic scars? 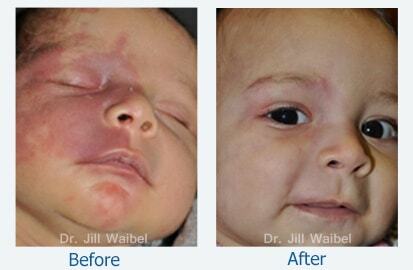 Scarring is inescapable when substantial damage to the skin occurs. The key is to minimize it with proper treatment of the original injury and any resulting skin abnormalities. Conservative strategies for traumatic scar revision commonly include a series of corticosteroid injections, usually combined with other interventions such as dedicated physical therapy and/or scar massage to mitigate scar contraction. Watch for formation of superficial blood vessels (telangiectasias) and skin thinning or depressions, which are signs of steroid overuse. These topical treatments are widely used for traumatic scars, although evidence to support their use is conflicting. Advantages include safety and low cost. Additionally, these approaches work best in combination with other approaches. Wraps and dressings that exert pressure on the wound may help prevent or reduce hypertrophic scarring. For minor discoloration due to injury, this process removes the upper layers of skin through the controlled application of chemicals such as TCA (trichloroacetic acid) and variations of combined topical peeling solutions. The board-certified dermatologists at Miami Dermatology and Laser Institute will design a peel program especially for each patient to optimize the results that can be achieved. Radiotherapy can minimize traumatic scars. This technique requires caution to avoid burning or worsening fragile scar skin. Physicians have long used both non-ablative lasers, such as the pulsed dye laser (particularly for scar redness), and fully ablative lasers, such as the traditional CO2 laser, for scar management. However, these lasers could not effectively address significant scar contractures because they did not penetrate deeply enough. They also caused excessive thermal damage when used aggressively. Newer fractional ablative lasers, such as the fractional CO2 and the fractional erbium YAG laser, avoid these problems. They penetrate more deeply than previous devices while maximizing safety by leaving untreated tissue between columns of treated tissue. 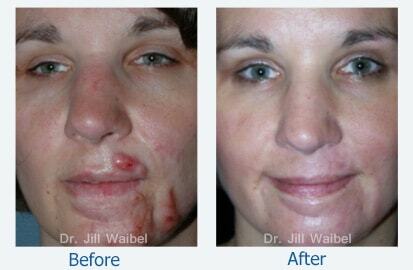 Dr. Jill Waibel has pioneered the use of these lasers for burn scars outside the military. Additionally, Q-switched lasers can lighten traumatic tattoos, and laser hair reduction can improve the comfort and fit of prosthetic devices. Patients who still have functional problems around a year after their injury or reconstructive surgeries may consider surgical procedures such as flaps and grafts to reduce skin tension. Traumatic scar revision may give you a new lease on life, restoring your appearance and diminishing unsightly scar tissue. For the most advanced treatments in traumatic scar revision available to residents of Miami, Ft. Lauderdale, Kendall, and nearby South Florida communities, contact Miami Dermatology and Laser Institute today, to schedule a consultation with Dr. Jill Waibel, our resident scar revision specialist.